People often ask how long it takes to walk across the Brooklyn Bridge. The Brooklyn Bridge isn't much more than a mile long, but as with many simple questions, the answer to this one is, "Well, it depends." A walk across the Brooklyn Bridge depends upon how fast you can walk a mile, but truthfully there are other components to getting across the bridge. The bridge is a quite popular tourist attraction and tends to get busy at certain times of the day and week (weekends are a bit nutty), so you might want to avoid crowds and take a morning stroll across the bridge. Also, you must always be aware of the bike lane when you're crossing the bridge since there is a steady stream of cyclists utilizing that lane. There are many tips for crossing the bridge, but here are some scenarios, so you can gauge the time of your trip. So you are in a hurry, are walking to get somewhere, and you've done it before. In fact, maybe you cross the Brooklyn Bridge on the pedestrian walkway just about every day on the way to or from work. And you certainly know where and how to get on the pedestrian walkway to the Brooklyn Bridge!, the short answer is, if you're walking just to get from one side to the other, allow a half hour for a brisk walk, unless you have running shoes on, in which case it can take you less time depending upon your speed. Medium Pace: Allow 45 minutes. You've done it before, and heck, the Brooklyn Bridge is nothing new. Still, it's not on your everyday route so you want to enjoy it. Or, you love the view, are taking a romantic walk with your honey, or just like to stroll slowly. Give yourself some time. Relaxed Pace: Allow 60 minutes. This is your first, or third, or fifth time walking across the Brooklyn Bridge, and you're in no rush, want to take photos, and plan to enjoy the moment. Weekend or Holiday Pace: Allow 60 minutes. There's often traffic —foot traffic and bike traffic, too — on a nice weekend and holiday days. So leave some extra time to cross the Brooklyn Bridge if you happen to be walking it when everyone else is, too! Walking Out-of-Towners Pace: Allow 60 minutes. Tourists like to gaze and discuss. They also like to take out selfie sticks and pose for photos on the bridge. If you're a tourist, you will probably want to savor the experience and take it slow. You probably don't need to allow more than an hour to get across the bridge. Take your time and enjoy. Once you cross the bridge and you step foot in Brooklyn, you must begin your trip by exploring Dumbo, Brooklyn Heights, which are neighborhoods that surround the bridge. You should take a walk through Brooklyn Bridge Park, and enjoy the views. You might want to take some photos there, in addition to the bridge, because the backdrop of lower Manhattan is quite stunning from Brooklyn Bridge Park. 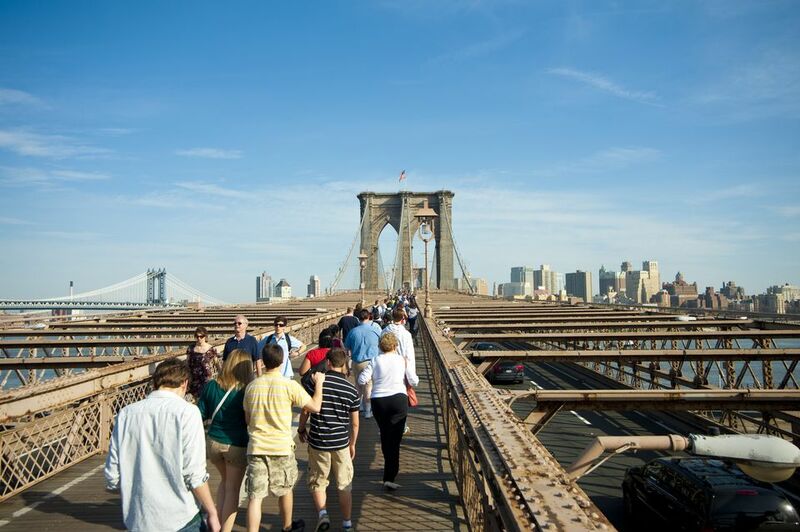 Is the Brooklyn Bridge Walk Way Open or Closed Today? Can You Walk the Verrazano Bridge to Staten Island? Outdoor Movies in Brooklyn Bridge Park!